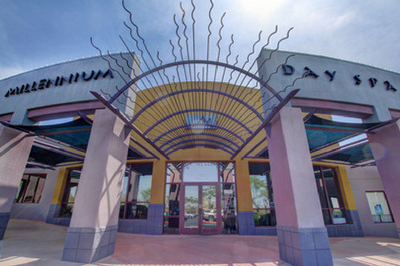 Located in the Grayhawk neighborhood in Scottsdale, Arizona, we are day spa and full-service salon committed to providing the most professional, personal, state-of-the-art, soothing and revitalizing experience to all of our customers. Upon entering the Millennium, you will be welcomed and pampered with elegant surroundings, a relaxing atmosphere, and attentive customer service. Millennium offers the latest innovations in massage therapy, facial and body treatments, private Himalayan Salt therapy, hair and nail services. With more than 20 years experience, each of our talented technicians stays on the cutting edge of the spa industry. Our luxurious, neighborhood salon will make you feel pampered and relaxed. Our expert stylists encourage you to receivecomplimentary consultation service to discover how to make you look and feel your best. Prices may vary depending on stylist’s experience and time required. Millennium's licensed skin care experts analyze and clean skin through a variety of techniques designed to leave you feeling rejuvenated and refreshed. We offer not only the latest advances in skincare but also safe, gentle aesthetic services to restore smoothness, softness and natural beauty. Experience air purification in our private relaxation Himalayan salt room – one of the first in the North Valley. Halo or Salt therapy has many benefits including improving your health, increasing respiration and boosting your mood and reducing stress. A unique day spa experience. With something for everyone, let us make you feel pampered and a priority in our day spa and salon. I experienced a CBD massage today that Millennium Day Spa & Salon is now offering. Holy cow...5☆'s!!!!! Dena was absolutely remarkable. I highly suggest this therapeutic massage with her. I am from Wyoming and come down to Scottsdale for a couple weeks every winter. I wait an entire year to get my haircut by Christine... she is AMAZING!! I first came to her when I had a bad haircut from a friend and she not only fixed my hair, she gave me the best style cut I've ever had!! I highly recommend Christine and now will not let anyone else cut my hair! She's the best. Got a chemical peel facial by CJ, it was amazing and she is the sweetest person ever. Great experience, clean facility, and my skin looks better than ever. Just had a massage with Sarah - it was definitely as good as it gets! Sarah is a true professional - an exceptional masseuse. She knows the body's muscles from head to toe and before you can tell her what needs massaging she hits the muscle and starts working away. Super nice person as well. Laura Sal is magnificent! I especially like it when I know she's not juggling multiple clients at the same time. She gives you all of her attention, care & artistry. She's a calm magician when it comes to hair. I can walk in, feeling like a mess, and walk out transformed & confident. We are lucky to have her here in Scottsdale. I spent an hour yesterday getting a hard gel full set with Tari, and she was AMAZING. She listened to every detail I told her and followed through, and stopped multiple times to make sure I liked the length and shape of my nails. I can't tell you how much that means to me, and how professional and kind she was. Within an hour of me leaving, two people had complimented my nails and asked if they were my own! I can't wait to make another appointment, I've found my forever nail salon! Thank you, Tari! Missy Shine is amazing! I had a bad color experience and I went to Missy for a correction. She is truly a Master Stylist. She talked through the correction with me to make sure it was exactly what I was looking for. I was so happy when I left that I have now rebooked with her and continue to be happy with the color and cut she does on my long, blonde hair. I highly recommend Missy! !